Jewish art has never been merely decorative. At the core of all quality Jewish art, is a Jewish message. This is expressed with imagery drawn from our religious tradition, history and sense of common destiny. Understanding Jewish symbolism, requires basic familiarity with Judaism and the classic Hebrew texts. To use that symbolism creatively and meaningfully, the artist must have a much more profound knowledge. After all, we are the “People of the Book” – and the artist is a kind of educator. Heschel wrote about Judaism’s demand for a never ending balancing act between the spontaneous, emotional Kavana – intent, and the disciplined and sometimes intellectualized acts of the Mitzvot – the Commandments. Good art needs both bravely expressed feelings, and intellectual discipline. Good art requires both novelty and rooting in cultural traditions. My earlier Jewish works were often created after spending weeks in libraries researching religious tests and earlier artistic traditions. The symbols, historical quotations and composition were all carefully pre-planned. I love playing with color, pattern and decoration. I enjoy historical trivia, telling stories. I value conceptual “art”, but I also love prettiness. 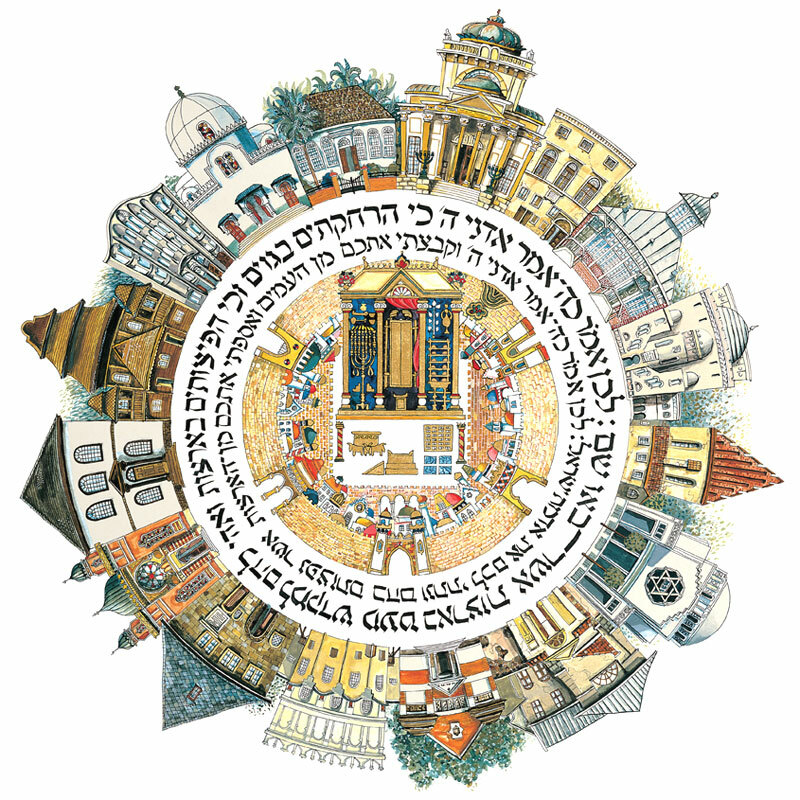 I love the Hebrew language of the Torah, as pure poetry as well as Divine Revelation. We are all composed of contradictions. I am for sure. So I hope to create Jewish art that is inventive, personal and fun. And I also try to enlighten my viewers, to what I find so fascinating and inspiring in Jewish civilization.